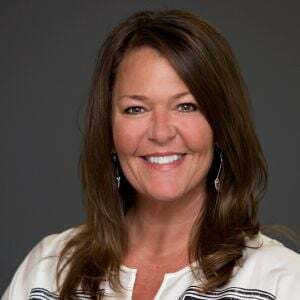 Selecting new model-year trucks is an annual challenge for fleet managers. 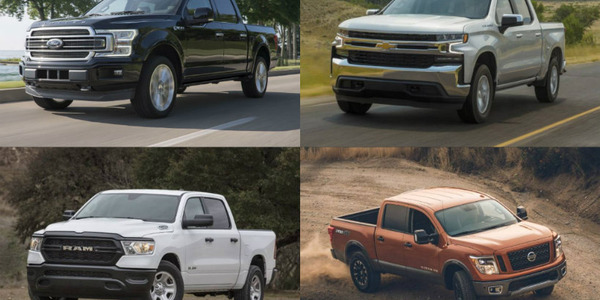 Take some of the time out of your research with this guide of trucks available for the 2018 model-year. New for the 2018 model-year is the Ford F-150 with five available powertrain options, including a diesel engine for the first time. 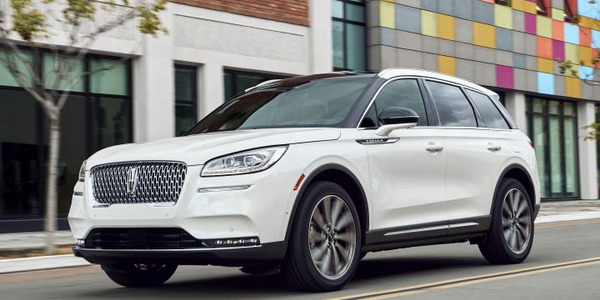 New features include auto start-stop for all engines, SelectShift 10-speed automatic transmission, available adaptive cruise control with stop-and-go functionality, and available pre-collision assist with pedestrian detection. Powertrain options include a second-generation 2.7L EcoBoost V-6 with SelectShift 10-speed automatic transmission; an enhanced 5.0L V-8 with payload capacity of 3,270 pounds and advanced dual port and direct-injection technology, paired with the 10-speed SelectShift automatic; a second-generation 3.5L EcoBoost V-6 with 13,200 pounds of towing capacity; an all-new 3.3L V-6 engine; and an all-new 3.0L Power Stroke turbodiesel V-6 mated to the 10-speed SelectShift automatic. Super Duty got its first major redesign for 2017. Moving to a high-strength, military-grade, aluminum alloy body combined with a fully boxed frame built of more than 95% high-strength steel cut up to 350 pounds of weight from the pickups, while increasing chassis strength by 24 times. 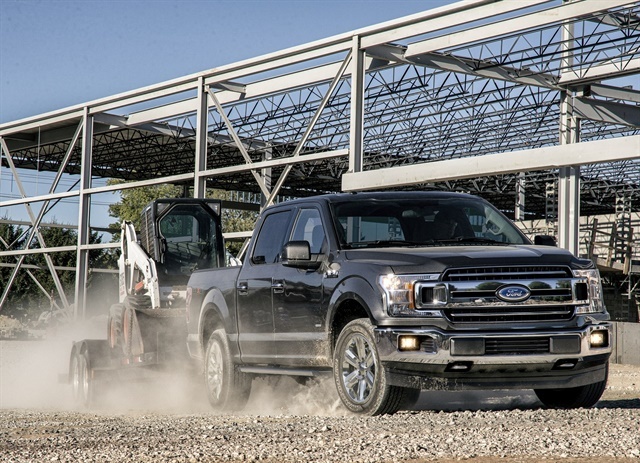 The Ford Super Duty Chassis Cab offers a front gross axle rating of up to 7,500 pounds and gross combined weight rating of up to 40,000 pounds. 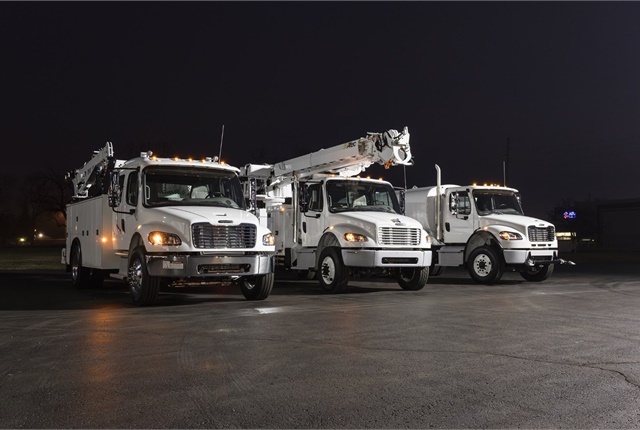 The medium-duty F-650 and F-750 are available with Ford-built gasoline or diesel powertrains featuring either a 6.7L Power Stroke V-8 turbodiesel with standard 270 hp and 675 lb.-ft. of torque or the 6.8L V-10 gasoline engine with 320 hp and 460 lb.-ft. of torque. The Ram 1500 is offered in 11 models and features three available powertrain options. The 3.0L EcoDiesel V-6 engine, 3.6L Pentastar V-6 engine, and the 5.7L HEMI V-8. Additional features such as Ram Box bedside storage, hidden bins, and a flat-load floor offer fleet cargo solutions. For 2018, Ram continues to offer enhanced capability in ¾- and 1-ton Ram 2500 and 3500 pickups with 31,210 pounds of towing, 7,390 pounds of payload, and 930 lb.-ft. of torque. 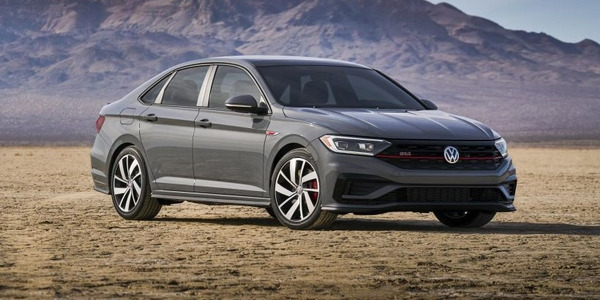 New for 2018 is the highest available torque at 930 lb.-ft., and a new Limited Tungsten luxury trim. Powertrain options include a 5.7L HEMI V-8 engine, a 6.4L HEMI V-8 gasoline engine with Fuel Saver Technology cylinder deactivation, and a 6.7L Cummins High-Output Turbo Diesel. 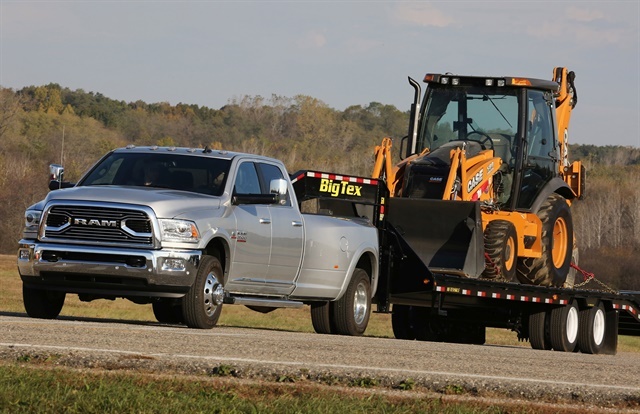 Ram 3500, 4500, and 5500 Chassis Cab trucks are engineered and designed for extreme daily work and to be upfitter friendly. With the start of 2018-MY production, the Ram 3500 will offer the ability to tow 30,000 pounds with a fifth-wheel hitch. Powertrain options include a 6.4L HEMI V-8 gasoline engine with Fuel Saver Technology cylinder deactivation and a 6.7L Cummins diesel engine. 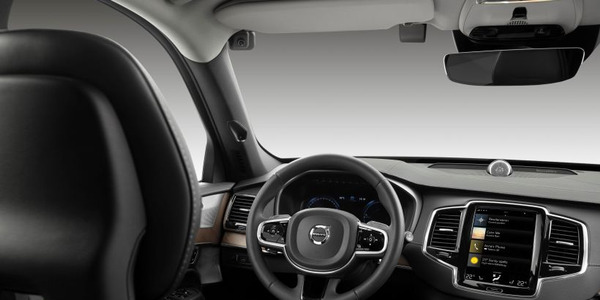 In addition, backup cameras are standard and a fleet telematics module is newly available for vehicle tracking. The Freightliner M2106 medium-duty truck or M2112 medium-/heavy-duty truck can be spec’ed with both proprietary and non-proprietary components to meet specific application needs. The truck is offered in a variety of configurations, including day cab, crew cab, and extended cab versions with GVWRs up to 66,000 pounds. M2 engine offerings for 2018 include new options such as Freightliner’s proprietary Detroit DD5 as well as a larger horsepower Detroit DD8. The M2 can also be spec’ed with Cummins B6.7 and L9 diesels. Transmissions for the M2 include Eaton Fuller manual gearboxes, the Eaton Procision and UltraShift AMT as well as the Allison 1000, 2000, and 3000 Series automatics. 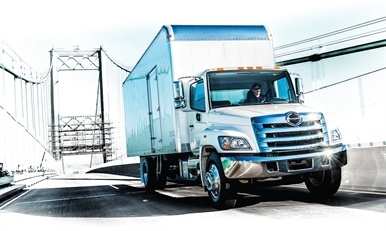 The Freightliner 108SD is also available, offering front-engine, rear-engine, and transmission power take-off options. The trucks are made from corrosion-resistant aluminum with e-coated steel, featuring both rivets and welded construction for weight reduction and added strength. In addition, Freightliner offers the 114SD, designed with enhanced visibility and driver ergonomics and comes equipped with a Detroit DD13 engine with up to 475 hp and 1,850 lb.-ft. of torque. All-new for the 2018-MY is the Low Cab Forward 6500XD. Standard equipment includes a 5.2L four-cylinder turbo-diesel that delivers 520 lb.-ft. of torque, an Allison 2500 Series 6-speed automatic transmission (with PTO), Dana axles, and a straight-rail frame. 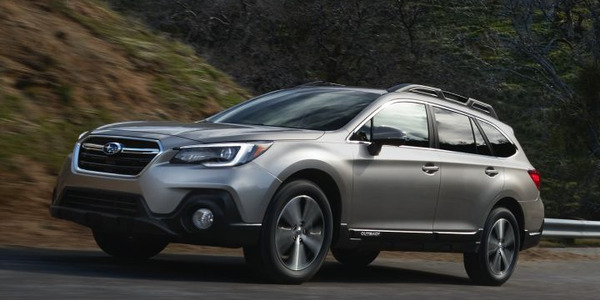 Front and rear axle ratings are 12,000 pounds and 19,000 pounds, respectively. Maximum GVWR is 25,950 pounds. In addition, the Low Cab Forward is also offered as 3500, 3500HD, 4500, 4500HD, 4500XD, 5500HD, and 5500XD models. GM also continues to offer the Chevrolet Colorado as a 2018-MY pickup and box-delete truck, featuring a 3.6L V-6 engine mated to a Hydra-Matic 8L45 8-speed automatic transmission, as well as an available trailer brake controller. The Silverado will continue with 1500, 2500HD, 3500HD, and 3500HD Chassis Cab models. The Silverado 1500 offerings include regular cab, double cab and crew cab body styles, all offered with 4WD. Box delete options are available on 1500 regular cabs and all HD cab configurations. GMC trucks for the 2018-MY include the Canyon and Sierra 1500, 2500HD, 3500HD, and 3500HD Chassis Cab models. The GMC Canyon is offered in SL, Canyon, SLE, All Terrain, SLT, and Denali models. A smart diesel exhaust brake system with the 2.8L Duramax enhances vehicle control and reduces brake wear on steep grades. The GMC Sierra 1500 range includes regular cab, double cab, and crew cab body styles, all offered with 4WD. In the Sierra 2500HD, an available Duramax 6.6L turbo-diesel V-8 engine offers 445 hp. The Sierra 3500HD features an available gooseneck/fifth-wheel trailering prep package and available LED cargo box lighting. Hino trucks offers 13 truck models for the 2018-MY. The Model 155 cabover engine truck features a 14,500 pound GVW with 210 hp and 440 lb.-ft. of torque. It is also offered in a double cab model (155DC) with multiple fuel tank location options. The Class 4 trucks are powered by a standard 5.0L J05 engine. The Hino model 195 is a cabover engine truck with a 19,500-pound GVW achieving 210 hp and 440 lb.-ft. of torque. Also offered is a double-cab model (195DC). Both trucks are powered by the Hino J05E 5.0L turbo diesel engine. Both trucks are available in multiple wheelbase configurations. The Hino 238 is a conventional truck focused on the delivery market. 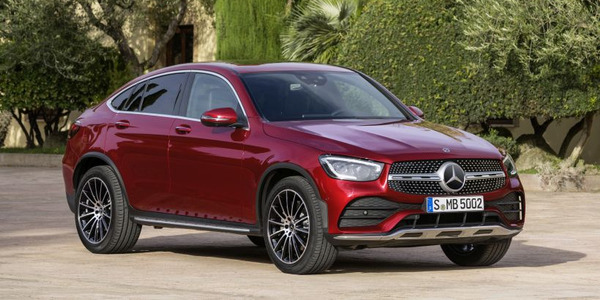 It offers a 23,000-pound GVW and achieves 230 hp and 520 lb.-ft. of torque. The truck is powered by the Hino 8.0L J08E-WU diesel engine. Also offered for the 2018-MY are the Hino 258ALP and 258LP models. 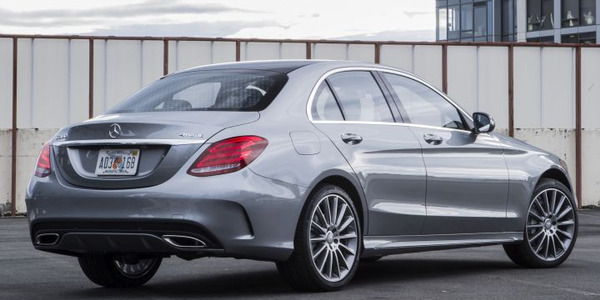 Both offer GVW of 25,500 pounds and achieve 230 hp and 520 lb.-ft. of torque, with 260 hp available. The trucks are powered by the Hino 8.0L J08E-WU engine. The “LP” designation stands for low-profile, while the “A” designation means “air brakes” are standard. The Hino 268 and 268A are conventional trucks that offer 25,950-pound GVW. Powered by the Hino 8.0L J08E-WU diesel engine, the trucks achieve 230 hp and 520 lb.-ft. of torque, with 260 hp available. The 268A truck comes standard with air brakes. The Hino 338 is a 33,000-pound GVW convention truck that achieves 260 hp and 660 lb.-ft. of torque. It is powered by the Hino 8.0L J08E-VB engine. Finally, Hino offers two hybrid truck models, the 195h and the double-cab version, the 195hDC. These 19,500-pound GVW diesel-electric hybrid cabover engine trucks feature the 5.0L Hino J05E-TP turbo diesel engine, which achieves 210 hp and 440 lb.-ft. of torque. It also features the 6th generation hybrid system with Ni-MH battery. A rear center-mount fuel tank is standard. 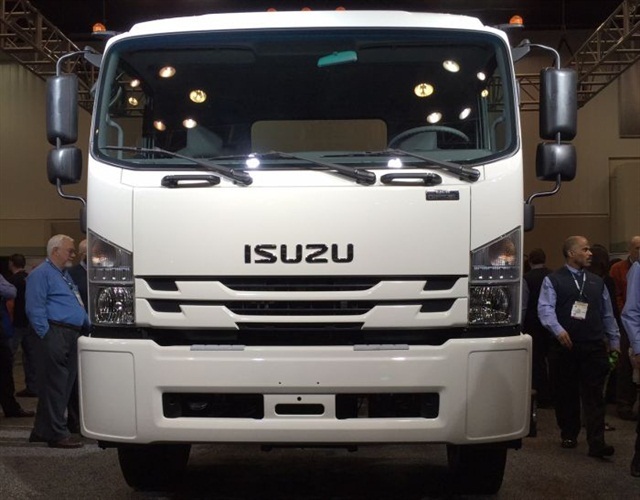 All-new for the 2018-MY is the Isuzu Class 6 Low Cab Forward (LCF) truck. The truck has a 25,950-pound GVW and wheelbases range from 152 to 248 inches. It is powered by a standard 5.2L Isuzu 4HK1-TC turbocharged four-cylinder diesel engine with a B-10 rating of 375,000 miles, achieves 215 hp and 520 lb.-ft. of torque, and is mated to an Allison 2000 Series automatic transmission with PTO opening. The remaining Isuzu lineup of low-cab forward trucks feature the 5.2L Isuzu 4HK1-TC turbocharged intercooled diesel engine and achieve 215 hp and 452 lb.-ft. of torque, mated to an Aisin A465 6-speed double overdrive automatic transmission with lockup torque converter plus PTO opening. The lineup includes the Isuzu NRR with a 19,500-pound GVW and wheelbase from 109 to 212 inches; the Isuzu NQR with a GVW of 17,950 pounds with a wheelbase range of 109 to 200 inches; the Isuzu NPR-XD with a GVW of 16,000 pounds and a wheelbase ranging from 109 to 176 inches; the Isuzu NPR-HD with a 14,500-pound GVW and wheelbase range of 109 to 176 inches. The Isuzu NPR Diesel offers a GVW of 13,000 pounds with a wheelbase range of 109 to 176 inches and body length up to 20 feet. The standard Isuzu 3.0L 4JJ1-TC turbocharged intercooled diesel engine achieves 150 hp and 282 lb.-ft. of torque and is mated to an Aisin A460 double overdrive 6-speed automatic transmission with lockup. The Isuzu NPR Gas truck has a GVW of 12,000 pounds with a wheelbase range of 109 of 176 inches. Finally, the Isuzu NPR-HD Gas truck has a GVW of 14,500 pounds and wheelbase range of 109 to 176 inches. Both the NPR Gas and NPR-HD trucks are powered by a standard 6.0L Vortex V-8 gasoline engine that achieves 297 hp and 372 lb.-ft. of torque and is mated to a 6L90 Hydra-Matic 6-speed automatic with double overdrive. The Isuzu N-Series features a Vortec gasoline engine that is CNG/LPG alternative-fuel capable. The Isuzu Diagnostic Service System (IDSS) allows diesel-model owners to receive a detailed “Health Report” from Isuzu dealers on performance data. Also, the NQR, NPR-XD, and NPR-HD, NPR Gas, and NPR-HD Gas all offer a crew cab option for up to seven passengers. The Kenworth T270 and T370 series are conventional Class 6 and 7 medium-duty trucks and tractors with GVWR up to 66,000 pounds and optional 4x4 and 6x6 configurations. Powered by PACCAR PX-7 and PX-9 diesel engines that achieve 200-350 hp and up to 1,150 lb.-ft. of torque, the T370 front axles are available up to 20,000 pounds. Manual, automated, or automatic transmissions are available. The Kenworth K270 medium-duty Class 6 cabover engine trucks are powered by PACCAR PX-7 diesel engines that achieve 200-260 hp and 520-660 lb.-ft. of torque with a GVW of 26,000 pounds. Wheelbases are available in 12-inch increments from 142 to 242 inches and it accommodates bodies from 16 to 28 feet. A clear back of cab frame/exhaust aftertreatment package is optional. The Kenworth K370 Cabover is a medium-duty Class 7 cabover engine truck in a 4x2 configuration, powered by a PACCAR PX-7 diesel engine that achieves 200-260 hp and 520-660 lb.-ft. of torque with a GVW of 33,000 pounds. It is also available with wheelbases in 12-inch increments from 142 to 242 inches and accommodates bodies from 16 to 28 feet. A clear back of cab frame/exhaust aftertreatment package is optional. The Kenworth T440 and T470 can also be spec’ed as Class 7 trucks powered by PACCAR PX-9 diesel engine that achieves 260-380 hp or Cummins Westport ISL G natural gas engine that achieves 300-320 hp. 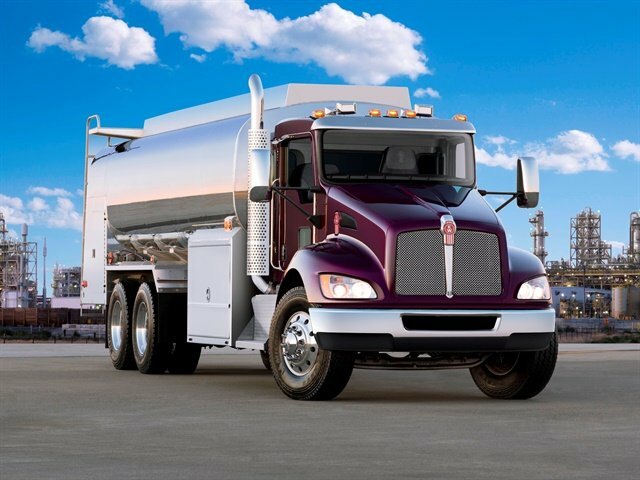 The Kenworth T440 is available as a straight truck or tractor with a GVW of 33,000-68,000 pounds. Manual, automated, or automatic transmissions are available. Finally, the Kenworth T470 is also available as a straight truck or tractor with a GVW of 33,000-68,000 pounds. 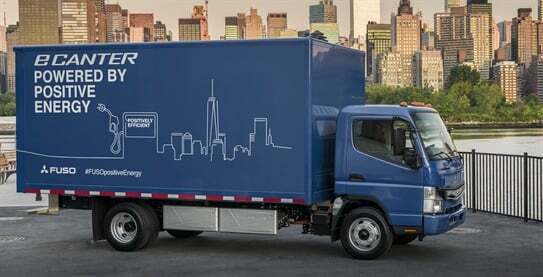 The all-new Mitsubishi Fuso eCanter is an all-electric, battery-powered medium-duty work truck. The Class 4 truck features a 15,995-pound GVWR and has a practical range of 60 to 100 miles, one-hour quick charge capability, and standard eight-hour overnight charging. The truck offers flexible battery configurations, so users can choose between maximizing range or increasing payload for shorter distances. In addition to the all-new eCanter, Fuso offers the FE130 as a Class 3 truck with a GVW of 13,200 pounds. The truck is powered by a standard four-cylinder DOHC diesel engine that achieves 161 hp and 295 lb.-ft. of torque and wheelbase options of 110.2 to 169.3 inches. The FE160 is a Class 4 truck, offered in cabover or crew cab models with a GVW of 15,995 pounds. 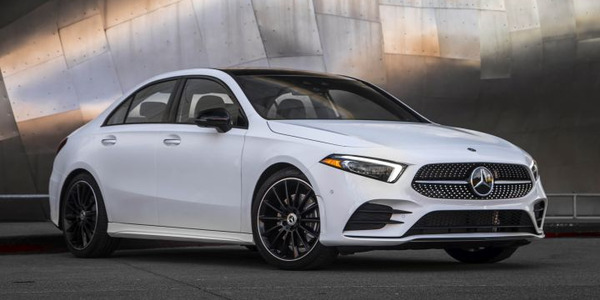 The trucks are powered by a four-cylinder, DOHC diesel engine which achieves 161 hp and 295 lb.-ft. of torque, with wheelbase options of 110.2 to 187 inches. Fuso also offers the FG4x4 model, a Class 4 truck with a GVW of 14,040 pounds. This cabover truck features four-wheel drive at the push of a button, allowing access to more rugged and severe locations than a traditional cabover truck. Powered by a four-cylinder diesel engine, the truck achieves 161 hp and 295 lb.-ft. of torque. Finally, the Class 5 FE180 cabover completes the Mitsubishi Fuso U.S. medium-duty lineup for the 2018-MY. The cabover truck features a 17,995-pound GVW and is powered by the four-cylinder diesel engine that achieves 161 hp and 296 lb.-ft. of torque. Five wheelbase options are available, ranging from 110.2 to 187 inches. For the 2018-MY, Nissan offers six available models for the Nissan Titan and Titan XD pickup truck. The Nissan Titan ½-ton pickup truck will be offered as a single cab, king cab, or crew cab, all powered by a standard 5.6L V-8 gasoline engine. 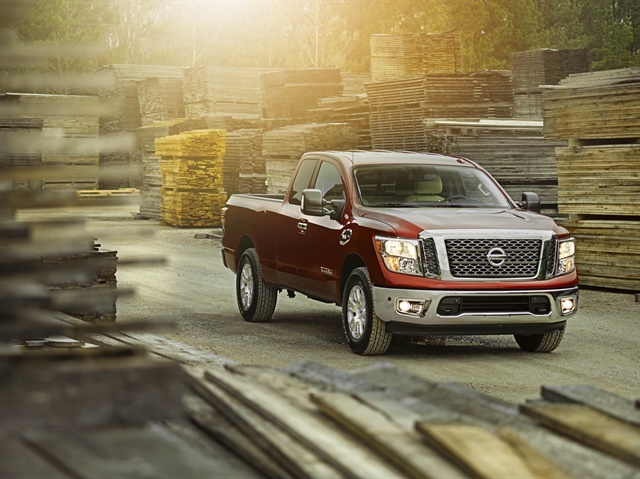 The Nissan Titan 4x2 offers a GVW of 7,100 pounds, while the 4x4 offers a GVW of 7,300 pounds. The Nissan Titan XD will also be offered as a single cab, king cab, or crew cab model, powered by a standard 5.6L V-8 gasoline engine or an available V-8 Cummins diesel engine. The Nissan Titan XD 4x2 offers a GVW of 8,600 pounds, while the 4x4 model features a GVW of 8,800 pounds. 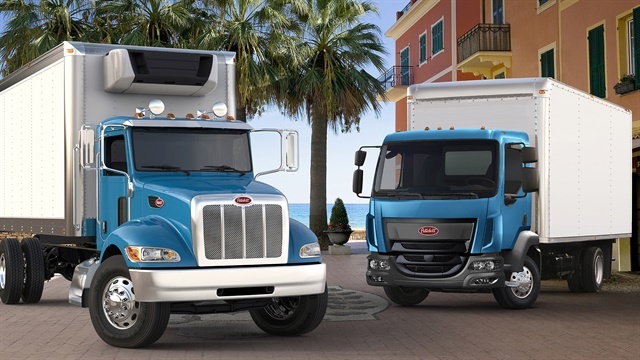 Peterbilt offers five medium-duty models available in 2018. The Peterbilt Model 220 is a cab-over truck that features a GVW range of 26,000-33,000 pounds. It is powered by the 6.7L PACCAR PX-7 engine that achieves from 200 to 260 hp and up to 660 lb.-ft. of torque. The Model 220 offers a tight turning radius, exceptional visibility and an optional Clear Frame Rail Package for clear rail space. 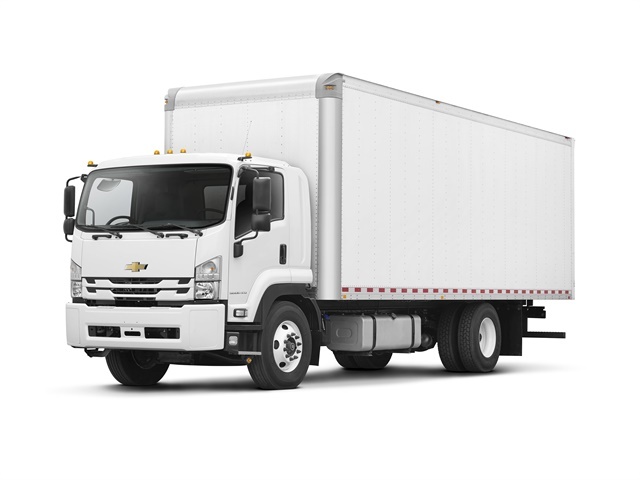 The Model 325 is a Class 5 truck that features a GVW of 19,500 pounds. It is powered by the 6.7L PACCAR PX-7 engine and achieves from 200-300 hp and up to 660 lb.-ft. of torque. Peterbilt offers the Model 330 with a GVW of up to 26,000 pounds. It is powered by the 6.7L PACCAR PX-7 engine that achieves from 200 to 325 hp and up to 750 lb.-ft. of torque. The Peterbilt Model 337 is available as a Class 7 truck or tractor with a GVW up to 33,000 pounds, as well as an all-wheel-drive configuration. It is available with either the 6.7L PACCAR PX-7 engine with a 200 to 360 hp range and up to 800 lb.-ft. of torque, or with the 8.9L PACCAR PX-9 engine with a 260-380 hp range. The Model 348 can be spec’ed as a Class 7 truck or tractor with a GVW from 33,000 pounds and is available in an all-wheel-drive configuration. The truck is offered with either the 6.7L PACCAR PX-7 engine with 280 to 360 hp or the 8.9L PACCAR PX-9 engine with 260 to 380 hp. With a wide range of optional content, the Model 348 meets the demands of virtually any work application. For the 2018-MY, Toyota offers the Tacoma and the Tundra. New for 2018 is the addition of Toyota Safety Sense, which features auto braking, pedestrian detection, and a host of other safety features that are now standard on all trucks. 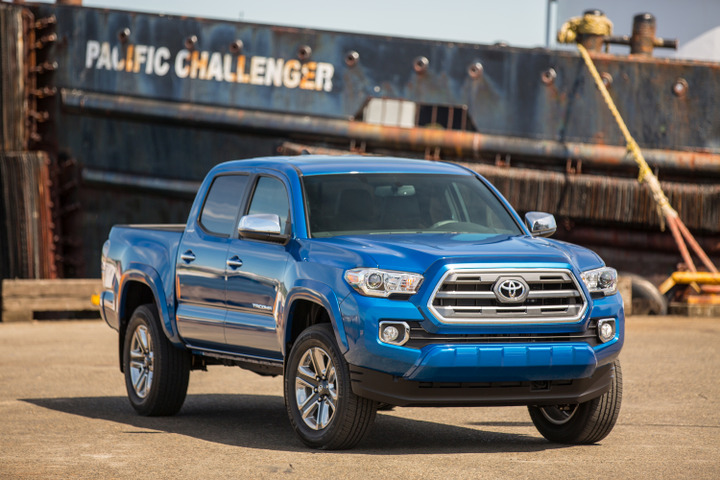 The Toyota Tacoma will be offered with either a 2.7L four-cylinder engine that can achieve 159 hp and 180 lb.-ft. of torque, or the 3.5L V-6 engine that can achieve 278 hp and 265 lb.-ft. of torque. The trucks are available in either 4x2 or 4x4 and can be configured as a traditional cab or double cab. The Toyota Tundra will be offered with either the 4.6L V-8 engine that achieves 310 hp and 327 lb.-ft. of torque, or the 5.7L V-8 that achieves 381 hp and 401 lb.-ft. of torque. The Tundra is available in a regular cab 4x2 or 4x4 configuration, a double cab 4x2 or 4x4, CrewMax 4x2 or 4x4, and several other trim levels and configurations.